A beautifully crafted polished stainless steel Yin Yang water feature. 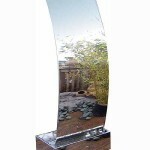 This feature will create a stunning effect in any home, garden or office. Suitable for indoor and outdoor use. It contains two large holes through the face of the feature. 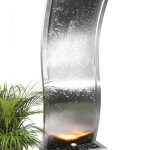 When installed, water is pumped up through the central base holes and flows out at both sides of the feature. 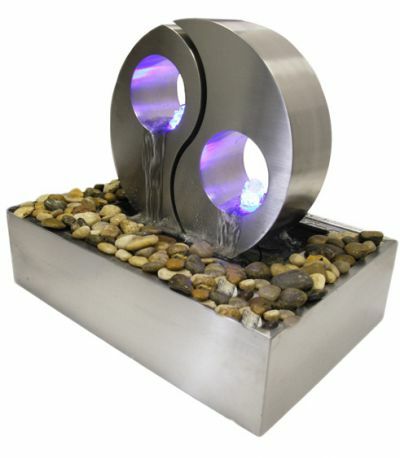 The Yin Yang symbol represents perfect balance and tranquillity, convey a touch of the Far East to your home, garden or office with this wonderful water feature. This feature comes complete with a pump (10m of cable), hose kit and also contains bright blue LED lights which creates a fantastic effect. Just sit back and enjoy the stunning view.